Up Down Cigar's origins are rooted in the distinctly unique world of experimental art. In 1963 Diana Silvius opened a small shop named the Gerald Bernard Gallery at 205 West North Avenue in Chicago's Old Town neighborhood. Her store featured the art of experimental and unknown local talents as well as an eclectic variety of campy and interesting merchandise. Mixed in with the assorted kitsch was a fine tobacco department. Area residents and her regular shoppers began to suggest complimentary merchandise that Diana should add to her stock. The more tobacco products Diana added, the more she sold. It was then that Diana began to fall in love with her customers who knew and enjoyed fine tobacco. By 1965 business was starting to pick up and Diana decided it was time to expand her operation and give the tobacco section of the shop its fair share of space. The store was moved around the corner and into a three-flat apartment building at the corner of Burton and Wells. Money was still tight, so equal parts of elbow grease and creativity were employed to accomplish the extensive remodeling that was necessary to convert the building from residential to retail use. The store's cases, counters, and fixtures were all made by Diana and her friends and family. Diana's husband used his talents as a sculptor and Diana her skills as a painter and copper enamelist to produce a one-of-a-kind shop with a truly distinctive and original ambiance. Old Town of the mid sixties had become gold mine for its businesses since people from all over the country were flocking to the neighborhood to see the hippies who congregated there and to shop in its strange little stores. Renamed the Up Down Shop because of its multilevel layout, the newly designed store had the distinctly funky Old Town look that people loved and Diana's business began to thrive. Occupying the garden level of the new complex was Diana's newly expanded tobacco selection and a homemade fudge shop which today lives on as Aunt Diana's Old Fashioned Fudge in Riverside. The second floor held a dress shop that featured all the hot designers of the day including Rudy Gernreicht, S. Howard Hirsch, Y.E.S., and Arpege as well as the paper dresses which were all the rage at the moment. On the third floor they did a brisk business selling magic tricks and props. Out on the street, the Original Red Popcorn Man hawked popcorn and cotton candy to the seemingly never ending stream of tourists who continued to arrive in droves ... business boomed. Things continued at this pace through Old Town's heyday in the mid-to-late 60's and on into the more difficult times that were to come during the 1970's. The thrill-seeking crowds went away and it was easy to see what merchandise was desired by the steady, repeat clientele. By now Diana had attended a few RTDA (Retail Tobacco Dealer of America) conventions in New York City and had begun to get familiar with the tobacco industry and some of its more prominent personalities. She decided that she liked this group of guys. Though being the first woman to break into the ranks of a male-dominated industry wasn't easy, Diana was up for the challenge. (Not only did she meet that challenge, in 1991 she was elected as the first female president of the RTDA.) By 1975 the store's focus was almost exclusively high-grade tobacco and after converting the second and third floors of the new building at Burton and Wells from shops into tobacco storage areas, Diana decided that it was time for a bigger, better tobacco shop. Diana had been eyeing an empty lot across the street and after an exhaustive search to find its owner she was able to securing possession of the lot. She contracted architect Howard Alan, a cantankerous, creative genius who hammered out the design for her dream store, the current Up Down Cigar at 1550 N. Wells. Part of her design was a huge wraparound humidor that allows for clear viewing of a vast selection of cigars, yet protects them from inexperienced and rough handling. As Diana explains, "...cigars go in your mouth, you don't want everyone to have fingered them. It's not as if you can wash them off like fruit." She also created a pipe tobacco blending bar and expanded her retail selling area by 100 percent. 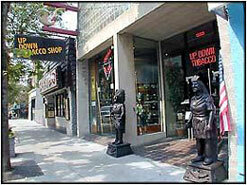 Her legend began to grow and word spread that if you came to Chicago and wanted a cigar, this was the place to go. Diana knew she couldn't rely on word of mouth alone to market her store. Positive, proactive media campaigns had to be launched to combat government sponsored anti-smoking propaganda prevalent in the early 1980's. Diana created the Chicago Pipe Smoking Contest (now in its 22nd year) and was one of the first people in the country to host formal cigar banquets. Diana campaigned vigorously to have November declared National Cigar Lover's Month and every year during the first full weekend of November Diana hosts the lavish extravaganza known as the Three-Day Free Cigar Party and an elegant Cigar Banquet at the Union League Club of Chicago. Over the years Diana has forged long, close relationships with manufacturers and suppliers from all over the world. These relationships proved crucial during the severe cigar shortages of 1995-97 when other stores, many of them new to the business, could only buy new brands of cigars that were usually made from poor quality tobacco and sold at deeply gouging prices. Because of her contacts, Diana was able to keep most of her established, big-name and sought after cigars brands in stock. Customers could feel confident that a trip to Up Down Cigar would allow them to replenish their humidors at a fair price. Diana has traveled the world in an effort to learn firsthand about the tobacco industry and to bring this knowledge back to her customers. In 1980 she made her first trip abroad and spent a week with the artisans at London's famous Dunhill pipe factory and at the Upshall factory near Stonehenge. She has visited many of the most renowned pipe manufacturers in Italy including Radice, Ser Jacapo, Savinelli, Becker & Musico, and Mastro De Paja, and has traveled to Denmark to visit with the staffs of Nording, Peterson, Nobel Cigars, and Stanwell. In Switzerland she investigated the Davidoff operations, and has made two other trips to visit the cigar manufacturers in the Canary Islands and Honduras. She was also one of the earliest repeat visitors to the cigar factories of the Dominican Republic. During her visits there she has developed a warm friendship with Hendrick Kelner, one of the world's foremost cigar experts and currently the head of operations at the Davidoff Factory (which also manufactures Avo, Paul Garmirian, and Griffin cigars). Diana has a particularly close relationship with the Fuente Family, including Carlos Sr., Cynthia and Carlos Jr. In 1988 she approached the Fuentes and asked them to help her develop her own line of cigars, now sold throughout the world as the Diana Silvius Diamond Vintage. The spectacular success of this wonderful cigar and the continued growth of Up Down Tobacco are testaments to Diana's hard work and nearly 50 years of dedication to the high-grade tobacco industry.